Another bobblehead traded. 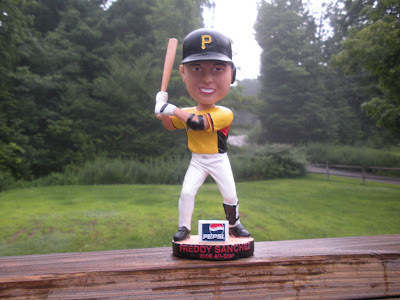 Freddy Sanchez was traded to the Giants for Tim Alderson. I said earlier today that Huntington pulled off his best trade with Wilson and Snell. I stand corrected. Alderson was the 22nd player taking in the 2007 draft. He is already in AA ball. The kid can pitch. In 2+ years in the minors he has a 20-6 record with a 3.07 ERA with 202 K's in 249 innings. Again, a great return for the Pirates. I may need a program Friday night. Go Bucs!